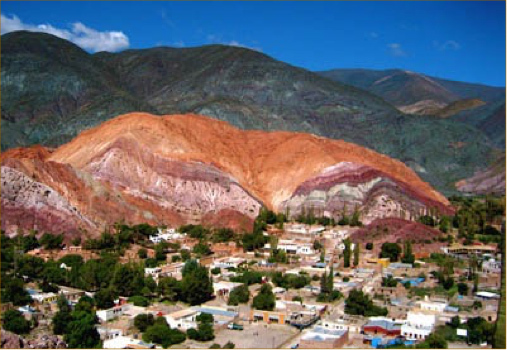 Today, explore the Quebrada de Humahuaca, a UNESCO World Heritage Site. This narrow valley offers beautiful landscapes rich in Andean culture and more than 10,000 thousand years of history, reaching back to the earliest first hunter-gatherers. Continue heading north to visit agricultural villages that cultivate crops such as corn, sugar cane, beans, citrus, bananas, and tomatoes, using the same techniques as a century ago, including the use of irrigation ditches built by their ancestors. The villagers also raise herds of sheep. Begin your day with a drive of about two hours to Cabra Corral Dam, where you have the opportunity to go rafting on Juramento River. After an introductory rafting and safety course, you gear up with lifejackets, helmets, waterproof jackets and pants. With your professional guide, you set out on your two-hour rafting adventure, which has easy Level III rapids. Take in the beautiful and tranquil landscapes of the Juramento Canyon. The canyon walls are some 65 million years old and have yielded some interesting fossils and dinosaur footprints. Stop along the way for a snack and barbecue lunch. After lunch, travel through the breathtaking area of Quebrada de las Conchas, best known for the range of colors, and its unique geography that ranges from the mountain desert to subtropical forest. This morning, you head to the town of La Poma and drive about an hour to Volcan Los Gemelos base. You begin your two-hour trek on a smooth walk to the top (expect some few rough paths on the road). Along the way, you will see the varied formations and rocks, some black, others with yellow undertones caused by sulfur, all caused when the volcano erupted. You will enjoy a picnic lunch at the summit along with the beautiful views from the top. 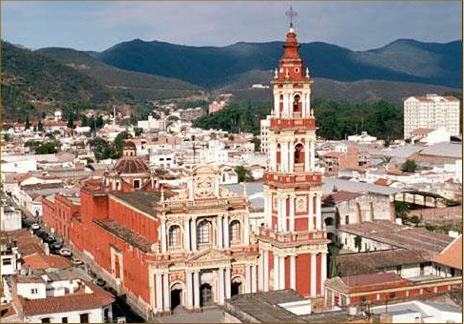 Return to the bottom and drive to La Poma town. Take a stroll from La Poma Nueva to La Poma Vieja, where you will see remnants of the old town, which was destroyed by an earth quake in 1930. The town is surrounded by snowy peaks. At the end of the afternoon, drive back to Cachi. Today you travel through Los Cardones National Park, where you see dramatic giant cactus plants before arriving at Cuesta del Obispo, a scenic mountain slope surrounded by lush vegetation. On this roughly three- to four-hour drive, there are have many photographic opportunities as you look for vicuñas, mountain cats, and falcons. You arrive in Salta and board your flight to the famous Iguassu Falls. You will explore the falls with your private guide from the Argentine side. The visitor center has restaurants, souvenir shops, an amphitheater and a space dedicated to the park´s ecosystem. There is also an exhibition (in Spanish only) detailing the indigenous peoples who lived in the area during the past centuries. The train terminal is at Central Station, some 400 meters/1,312 feet away from the main gate, and this is where the first leg starts. You can either ride the train or take a 20-minute easy walk along Sendero Verde (green trail). Both ways will get you to Cataratas Station, the starting point of the Upper Circuit. The Upper Circuit is a half-hour walk along a 1,200-meter/3,900-foott trail – with low degree of difficulty and no stairs – that goes deep into the jungle. You will get several up close views at different observation points and panoramas toward the end of the trail. The second leg of the train ride leaves Cataratas Station and goes to Garganta del Diablo Station. The trail goes across several branches of the upper Iguazu River, well into the rain forest. You have the chance to see a variety of birds, including toucans. Devil’s Throat is a deep 70-meter/230-foot roiling pot where several branches of the Iguazu River converge, causing a violent water fall. A balcony set up at the border allows you to enjoy this stunning visual experience. Today you can enjoy one of the excursions such as sailing on Parana River, visiting beaches, swimming and enjoying beautiful hidden falls. Visit falls such as Yasy amid the lush environment that includes some 15 small falls ending in Parana River. Located on the banks of the Parana River, a chapel was built by renowned Argentine architect Alejandro Bustillo in colonial style. 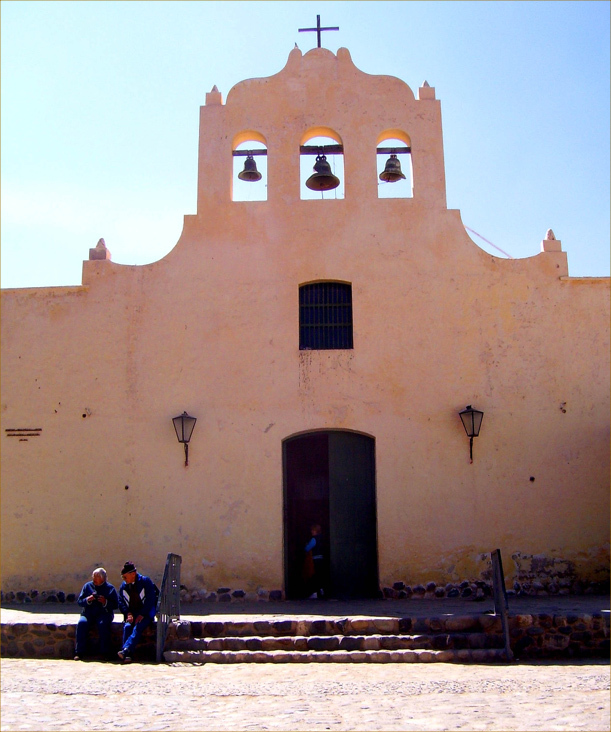 The chapel is dedicated to Itatí Virgin, and has its original black and white vitraux brought from France. At one time, the parishioners followed Sunday mass from their canoes. This lovely chapel can be booked for weddings or special celebrations. Walking half an hour along the jungle and within hotel facilities, you reach Guatambu waterfall, a water cascade with a large natural water pool. Other activities include bicycling on forest rails or kayaking on Parana River, which divides Argentina and Paraguay. Hike along Bemberg Port Reserve paths, accompanied by naturalist guides. 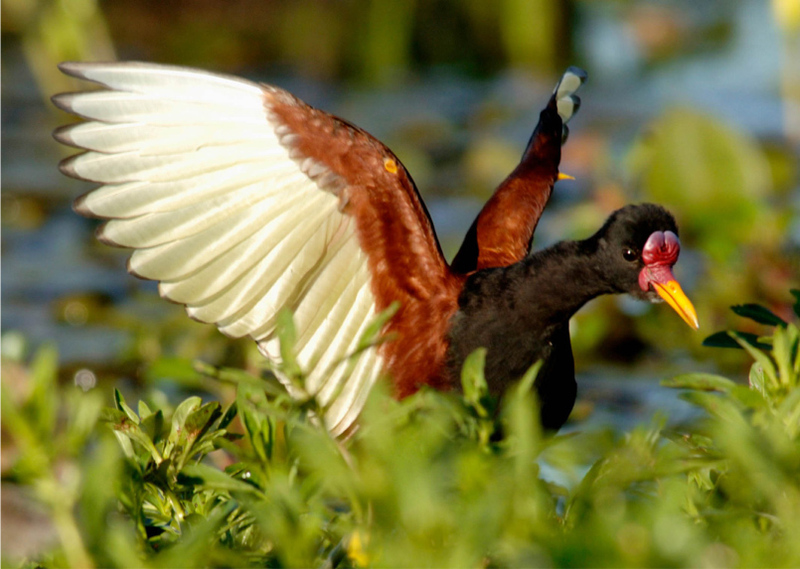 You may spot trogons, hawks, red-ruffed fruitcrows, dusky-legged guans and various toucans. Learn about sounds and animal print recognition from your guides. This morning, you will be transferred to the airstrip to board an aircraft to your next destination, the Marshlands of Ibera. In 1999, Conservation Land Trust Argentina (CLT) launched an important project preserve Ibera’s ecosystem in a 12,000-hectare/30,000-acre former cattle ranch. The first step was to remove all cattle in order to allow the local fauna to return. Some indigenous species such as the anteater had to be re-introduced. CLT removed all exotic vegetation and replaced them with native plants. The plan is to create an area that will conserve, in perpetuity, the natural ecosystems of Ibera. CLT bought a further 150,000 hectares/ 370,658 acres of former cattle ranches closest to public lands. The ranches include ecosystems not present in the Provincial Park, such as flooded grassland, open forests of thorny, dry shrubs called “espinales” and gallery forests. The plan is to donate these “high lands” to the state and, with the flooded provincial public lands, create an area of more than 700,000 hectares/1.8 million acres, becoming the biggest natural park in Argentina. After breakfast, you will be picked up from your hotel for a private transfer to the airstrip for your flight back to Iguassu, then connect with your flight to Buenos Aires. European in appearance, Buenos Aires can keep any culture-oriented visitor busy indefinitely. 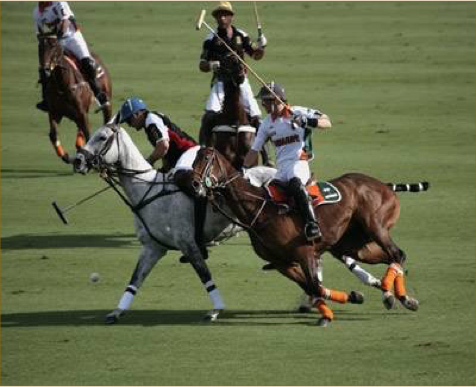 The city has a year-round calendar of events from premier cultural events, to some of the world’s best polo matches and excellent football, to the local gaucho game of “pato”, a sort of basketball on horseback. This afternoon, discover this sophisticated metropolis and Argentina’s capital. It is undoubtedly one of the world’s most exciting cities with a vibrant cultural scene and its legendary street art. On an intriguing three-hour graffiti tour, you’ll see a different side to Buenos Aires, meeting the city’s artists and visiting local galleries. Enjoy a personalized experience on this small-group art tour as you leave the well-trodden tourist routes to see a different side of Buenos Aires with your expert local guide. Gain cultural insights into the political origins and modern-day issues of Buenos Aires. Your tour is run in collaboration with Buenos Aires’ leading artists, taking you to the neighborhoods of Colegiales, Chacarita, Villa Crespo and Palermo to visit art studios, graffiti hotspots, open-air galleries and the city’s only street art bar and gallery. Admire the artists’ handiwork, with the opportunity to shop if you like. Listen as your guide explains the meaning behind urban murals. 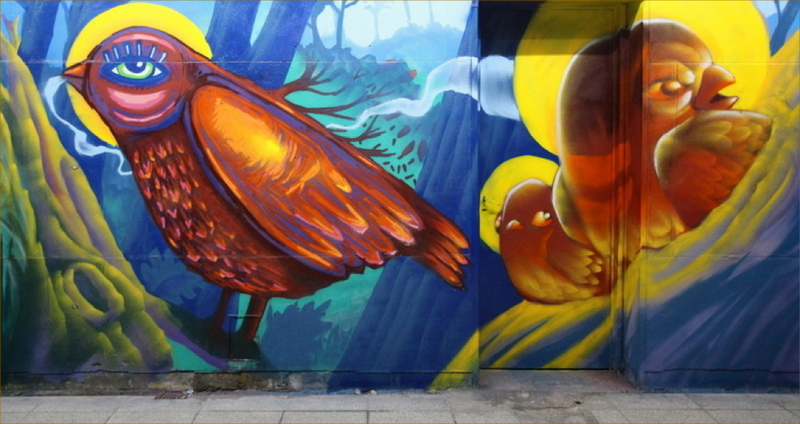 All proceeds from this non-profit tour go to supporting Buenos Aires’ urban art scene. paced game of pure adrenaline. More than 30 horses may be used in a single game. As you enjoy the game, your bilingual guide will explain the fundamentals of the game, its rules, and techniques. For lunch, you savor a barbeque “asado”. Argentina is renowned for the quality and flavor of their meats. You sample the selection of delicious local meat dishes, accompanied with local wines. A vegetarian option is available. Any airfare; Any passport or visa fees; Supplemental Travel Insurance (which is strongly recommended); Excess baggage fees; Items of personal nature such as gratuities, telephone / fax / internet charges, laundry, beverages, meals and services not specified in the itinerary. At Big Five, you are working with one of the most experienced groups in the travel industry. Our Destination Specialists receive 900+ hours of in-destination and in-office training annually; and have a combined average 20 years’ experience in travel. Big Five is in the top one percent of luxury tour operators to place on Travel+Leisure magazine’s A-List. Our Destination Specialists have appeared on this distinguished list of top travel professionals from 2009 to 2015. This list validates the value of experience. This recognition is achieved by going through unbiased questioning and itinerary planning, and it is not based on voting by magazine subscribers. journeys to meet each guest’s interests, whether that is honeymoon couples, families or special interest groups. Big Five guests benefit from our partnerships with properties and suppliers who have strong sustainable ethics built into their operations, which assures each guest will experience the best a destination has to offer. As part of our commitment, we employ local professional guides and drivers in each destination; and we support local initiatives dedicated to cultural preservation and habitat conservation.